What is Water Backup and Sump Pump Overflow Coverage? Day 012 | What is Water Backup and Sump Pump Overflow Coverage? Carley and Waldo finished their basement with carpeting, sheet rock, and a minibar. It looked great. They took a much-needed weekend get-away to Branson. During their time away it rained like cats and dogs. Their sump pump couldn’t keep up with all the rain water and it overflowed into the basement, damaging the carpet, trim, and cabinets. They returned home to a musty smell coming from the basement. Unfortunately the loss is not covered due to the sump pump overflow exclusion on their homeowners policy. They could have added Backup of Sewer and Drain coverage to their homeowners policy and it would have been covered. The same would be true If Carley and Waldo’s sewer or drains backed-up and water got into their home, causing damage. This too would not be covered unless they added the Backup of Sewer and Drain endorsement to their policy. This endorsement does not come automatic. It’s an inexpensive addition to any homeowners policy. Don’t assume. Ask your agent. Did you miss a day? 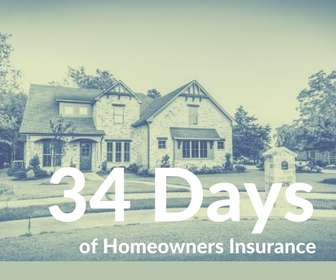 You can catch-all 34 Days of Homeowners Insurance here.